We moved to Kunming nearly two years ago. 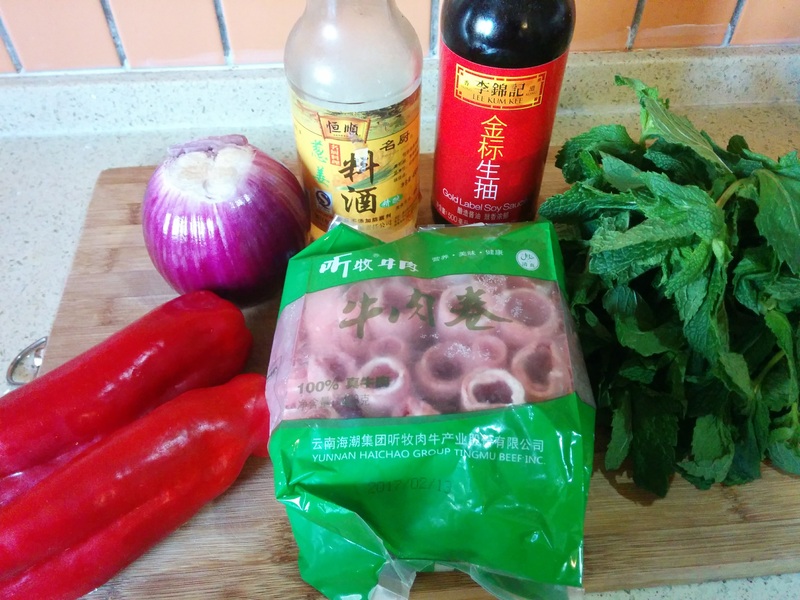 It’s high time I started adding some Yunnan recipes to my repertoire. So, here’s dish #1. 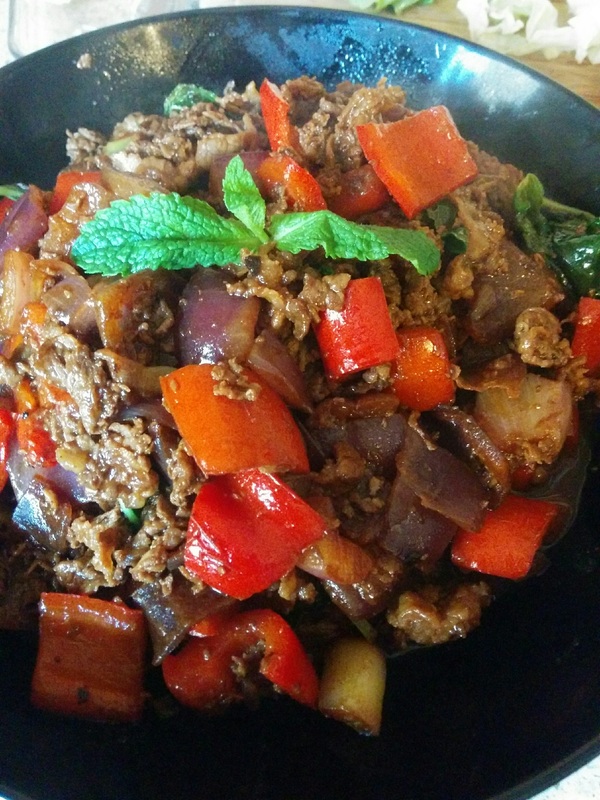 My creation is loosely based on an iron-plank beef dish my family loves here in Kunming. It’s got spicy peppers, cooling mint, and creamy butter. The combination may sound a bit odd, but it’s mm-mm-good! Fun fact: In Yunnan, the rule of thumb is “beef always needs mint” whereas in Guangxi, the default was “beef always needs ginger.” I can add that to my list of ways to know I’ve crossed the border. I normally don’t cook with measurements. (Bake, yes. But cooking? Especially cooking Chinese food? No way, Hou Shei.) For the sake of posting this recipe, I measured. But promise you won’t get tied to the numbers, okay? 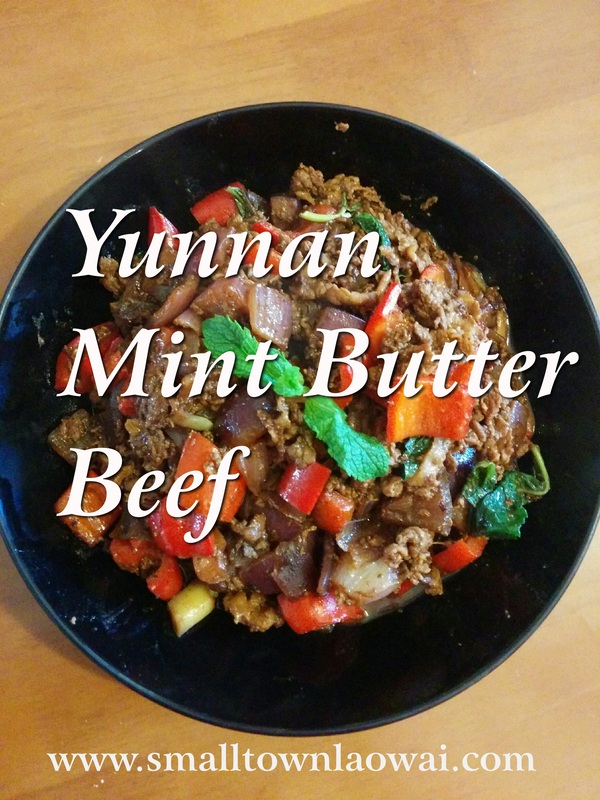 If you think it needs more butter, or you only have half an onion, or want oyster sauce added in, then tweak away! 好的, we are ready to cook! 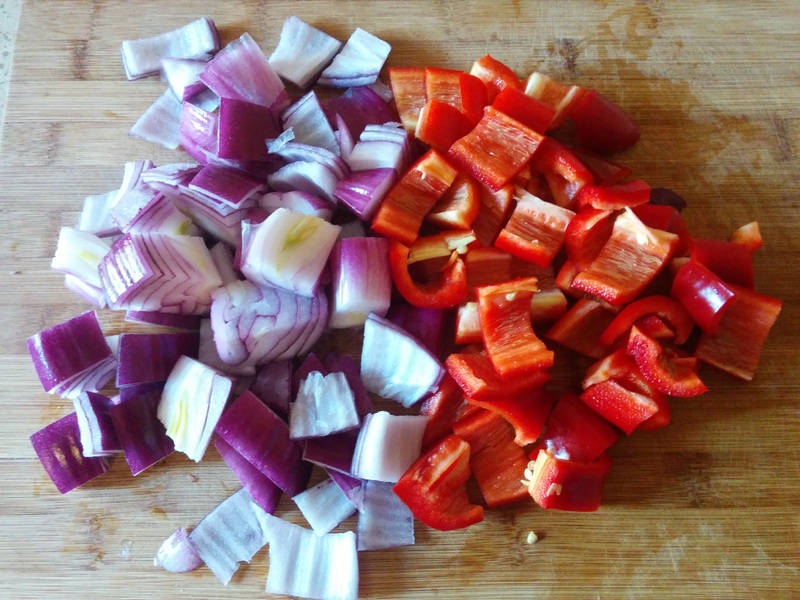 Chop up the onion and peppers. The peppers are the only factor that affect the spiciness of this dish, so this is Step One of choose-your-own-adventure cooking. The creaminess of the butter and the cooling taste of mint work really well with some heat in this dish, so I like to have slightly spicy peppers. You can obviously go pretty hot if you’d like. Or, if you (or family members) don’t do spicy, use red bell (sweet) peppers. Yellow or green would also work, but the dish is prettiest with red, IMHO. Wash the mint leaves. It’s okay for them to be wet. In fact, it will help a bit in the stir-frying process. 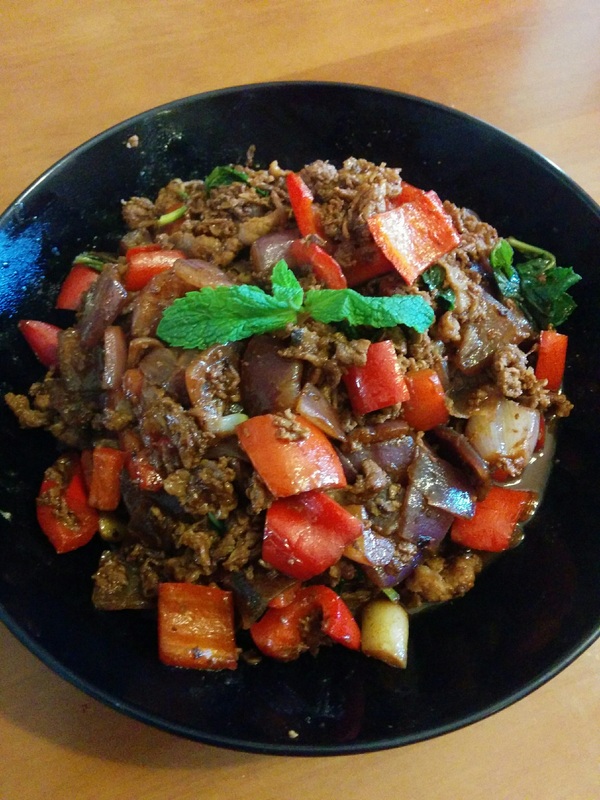 Heat oil in a wok or big skillet. 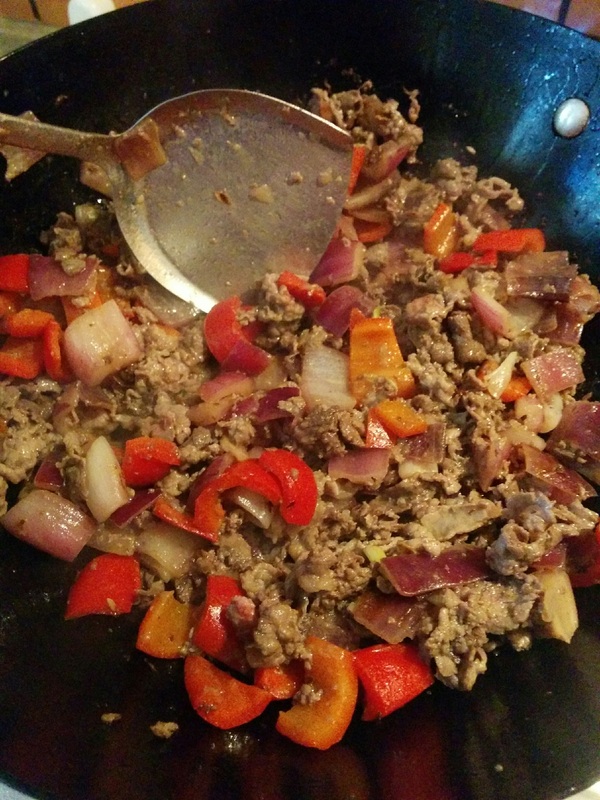 Add peppers and onions. Stir fry until they’re as done as you’d like them. 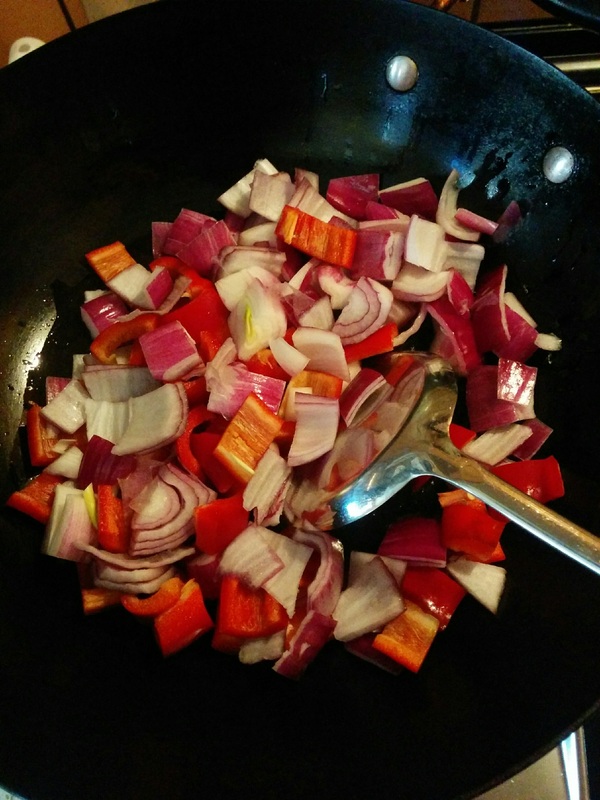 Really high heat (I’m talking flames coming up the sides of the wok) for a short time will give you crisp peppers and onions with a bit of blackening. That sounds delicious to me, but it’s a big no-no for many Chinese chefs. You can turn the heat to just normal high and add in a little bit of water if you prefer softer veggies with no blackening. Give them a light sprinkling of salt as you cook them. 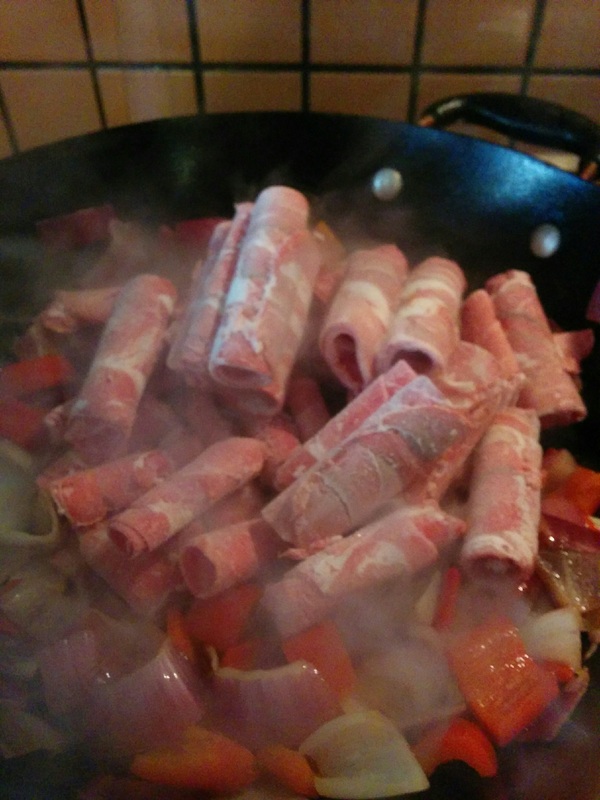 When the pepper and onion are cooked to your liking, dump in the beef rolls. This generates a nice dry-ice smoke effect. Oooooh…. Stir fry until the beef is all cooked, then stir in the sauces: soy sauce, dark soy sauce, and your cooking booze of choice. Add the butter. It should melt pretty quickly. Give everything a few good stirs, then taste your creation and adjust the seasoning at this point before you add the mint. It’s choose-your-own-adventure cooking, remember? Tweak your heart out. 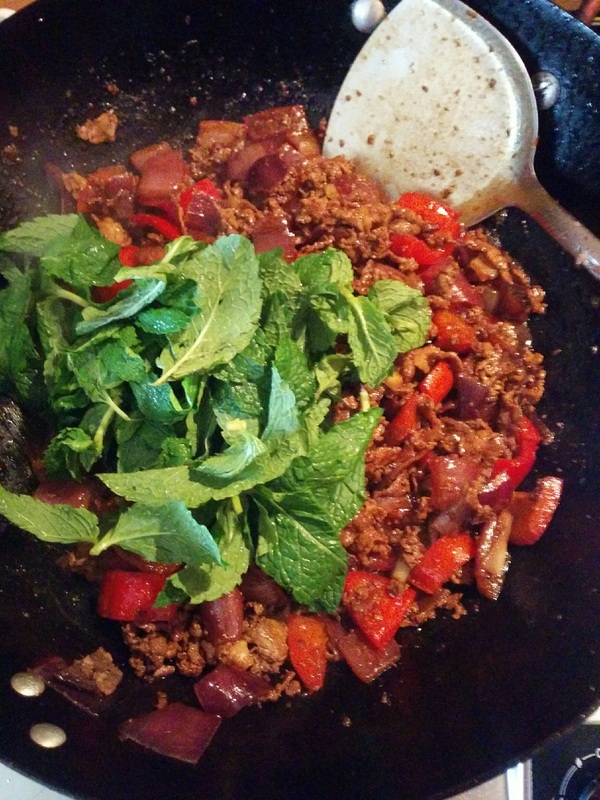 When you’re happy with how it tastes, add in the mint leaves and toss them around quickly. Turn off the heat and stir a few more times. The mint leaves will keep wilting this whole time and that is how it’s supposed to be. And then? You’re done! Dish it up, and dig in. And tell me what you think! What did you tweak for your version of this creation? Heat oil in wok. 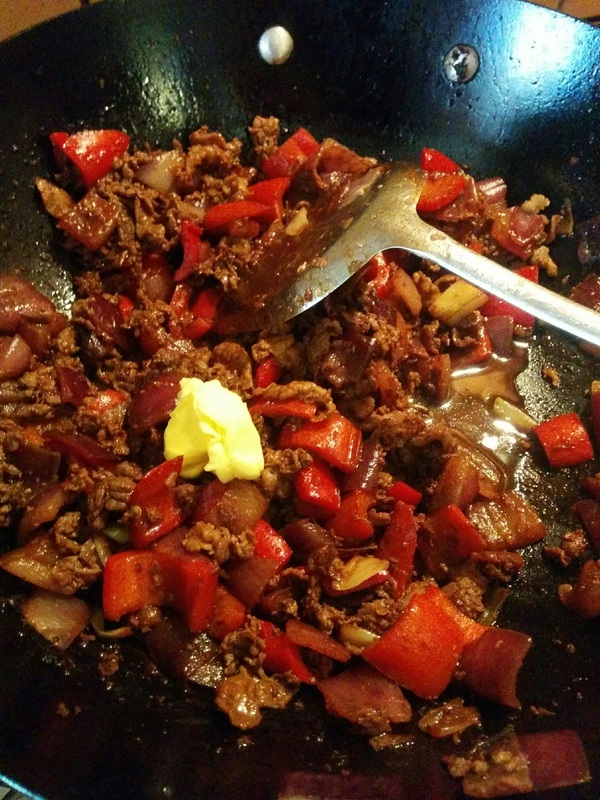 Add onion and peppers, stir fry until done to your liking. Add beef rolls, stir fry until beef is cooked. Stir in soy sauce, dark soy sauce and cooking wine. Stir in butter until melted. Taste and adjust seasoning. 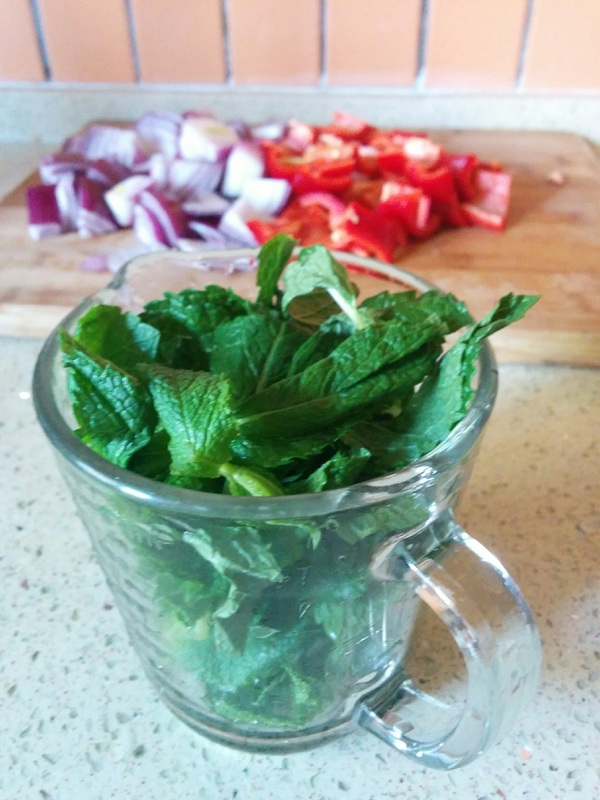 Add mint leaves, toss a few times. Turn off heat and toss a few more times, then transfer to serving dish. Garnish with fresh mint leaves, if desired. Get another helping of Small Town Laowai sent right to you. How to Make Chocolate Chip Cookies in Just Two Months! It really looks delicious. If you have a chance watch the show called a “Taste of China”. There are small episodes of homemade food cooked in different areas in China. I love this show and now it is streaming on Netflix too. Every time I watch it makes me appreciate some of the Chinese hard work to cook something, sell it and have a big smile. I meet lots of humble people while I lived in China. I travelled in many places and I try to return there and visit beautiful places and try new dishes. The northern part has lots of noodles and the south has rice. I took a cooking class for pulled noodles. I really admire the people who can make pulled noodle in a mater of seconds. I worked in business area in beijing and in our cafeteria daily you could order pulled noodles in the shape you wanted- think and wide, thin, round and so on. If your are an adventurous person I recommend to visit China. Jenny, thanks for the recommendation of that show. It sounds really interesting! China is enormous and has so many different kinds of cuisine. It’s fun to keep learning about food from the different regions. No matter how many times I eat pulled noodles, I still find it fascinating to watch them being made. I think it would be a disaster if I tried to do them myself. How did they turn out when you did them in your cooking class? Wow! It looks great and I can’t wait to try it, Emily! Thanks so much for sharing!! Let me know how it turns out, Marcia! Looks yummy! I don’t think they sell mint anywhere I’ve been…or maybe I just didn’t recognize it?! Now I want to find it!! Fresh mint…mm!! I can’t remember ever seeing mint in Guangxi, so it’s probably a regional thing. But you can buy mint seeds (and even live plants, I think!) on Taobao and try growing it yourself. Mint is super easy to grow. Philly cheesesteak is a fantastic use for those beef rolls! I am definitely going to try that. What cheese do you use? Thanks for that suggestion, Ashley! Wow, I had no idea butter and mint were cooking ingredients anywhere in China! Yeah, it surprised me, too! But given our proximity to Laos, I guess it shouldn’t have been a surprise to find mint. The butter is…because we’re also near Tibet? Not sure.